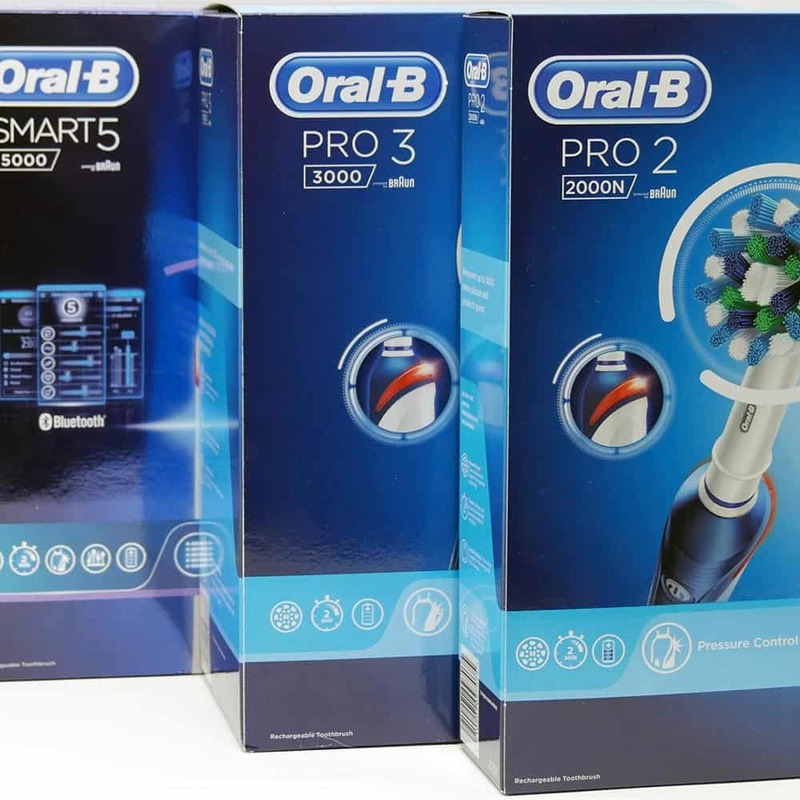 Oral-B are one of the market leaders with their range of electric toothbrushes but with such a healthy range of brushes it can often be difficult to easily tell the differences between each model and find the one that is most suitable for you. How many cleaning modes does it have? Does it have they key features you want? In this article we cover the key differences between all the brushes in Oral-B’s range for 2017-18 and answer many of the common questions we are asked. 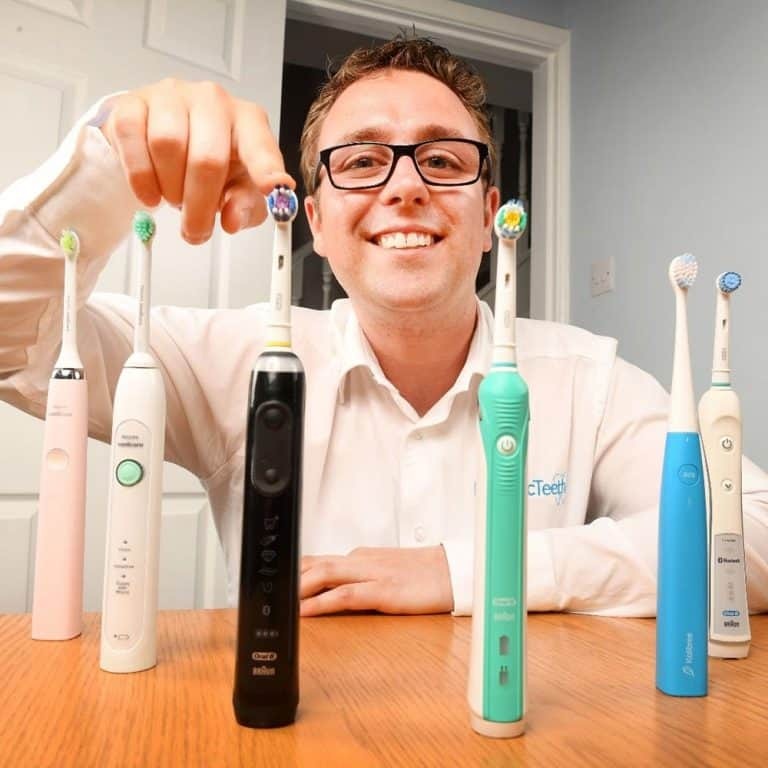 If you’re in a rush and want a quicker answer, you may like to check out our article on the best electric toothbrushes. For convenience and quick reference the following graphic (click to enlarge) outlines the key differences between all of the brushes currently available. For every brush listed and spoken about we have conducted a thorough hands on review which you can read, by following the links provided. We understand that you might want to delve a little deeper into the choices available to you. From the table above you may think a couple of brushes are suitable for you or indeed have seen other brushes from other brands that you want to compare to. However, it can quickly become confusing and it is not always easy to pick that one perfect brush. Similarities and minor differences make one brush win out over another, often these things only come from having used the brushes. Thankfully we have and we can really help you find the right brush for you. In this article we have compared some of the more popular models in more detail than just the infographic shown. We give you some insight into how they compare when used on a daily basis. We tell you what they are really like to use, rather than just what the brands tell you! Whilst we hope to answer most questions, if you really want to dig down into the detail and compare particular brushes side by side, looking at things like weight, our overall review rating, you can use our toothbrush comparison tool, to get that extra bit of detail and make your task of finding the right brush for you a little bit easier. And if you are still stuck or want more information then by all means contact us and let us know how we can help you. Whilst they are not shown in the table above, many of the 2017 models have evolved from older models. As such it is important to understand the differences because some retailers will continue to sell the old models until all the stock has sold, which can take some time. It might also be that the ‘older’ versions are more suitable for you. The 2017 model has a Lithium-Ion (Li-Ion) battery rather than a Nickel Metal Hydride (NiMH) which more than doubles the usage time from 7 to 16 days. There is a 2000N model which includes 1 x CrossAction brush head and a 2000S model that includes 1 x Sensi Clean UltraThin brush head. The 2017 model comes with a travel case include in the box – older models did not. The 2017 model does not have the Sensitive cleaning mode found on the Pro 3000. The 2017 model comes with a CrossAction and 3D White brush head compared to the CrossAction and Sensitive supplied with older models. Older models came with a brush head stand – the newer model does not. The 2017 model comes with 2 brush heads (2 x CrossAction or 2 x SensiClean) compared to the 3 (CrossAction, Sensitive & 3D White) with the SmartSeries. The 2017 model comes with 3 cleaning modes (Daily Clean, Sensitive and Whitening) compared to the 4 with the SmartSeries. It loses the Gum Care mode. The 2017 model comes with a brush head stand for up to 2 brush heads compared to the storage compartment for up to 4 brush heads provided with the SmartSeries. The 2017 model has a more powerful motor offering up to 10,5000 oscillations and 48,000 pulsations compared to 8,000 and 40,000. Now we shall compare the new models so that you can better understand the differences and which brush is most suitable for you. 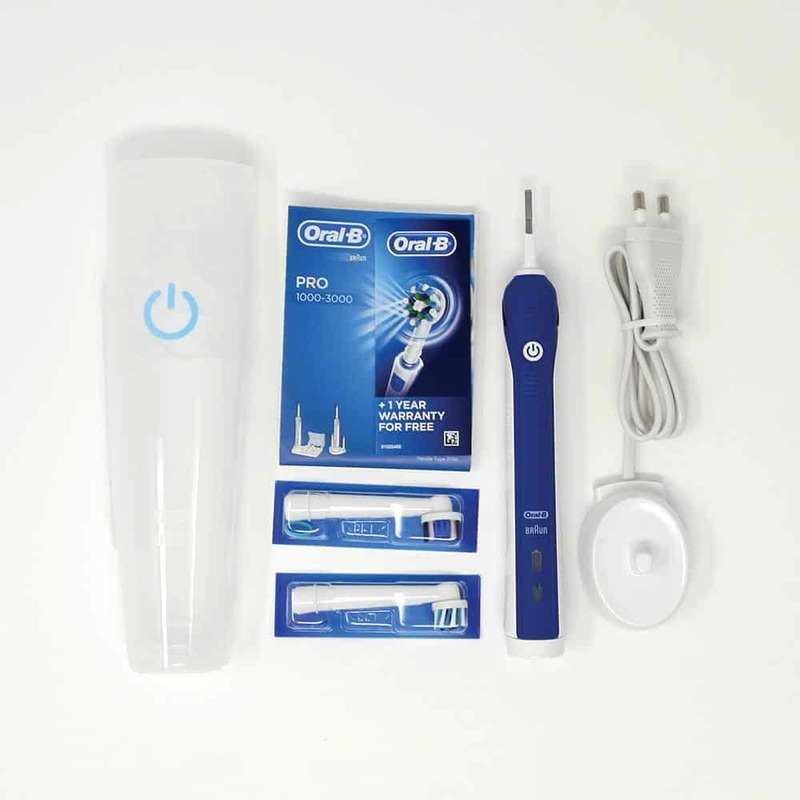 Two of the more cost effective models within the Oral-B range of electric toothbrushes, these two are among the most popular models available on the market today and either serve the vast majority of users very well. 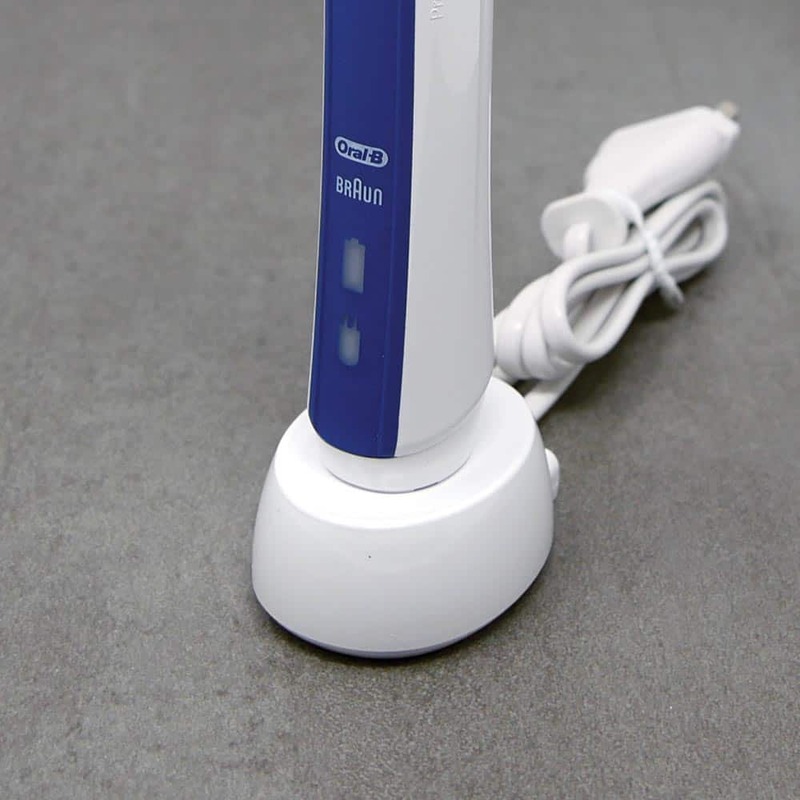 Both models offer most of the benefits of an electric toothbrush without having to pay ‘too’ much for them. One of the biggest differences is that the Pro 2 2000, which is the more premium model offers an extra cleaning mode. Both offer the standard ‘Daily Clean’ mode, but the 2000 comes with a Gum Care mode. 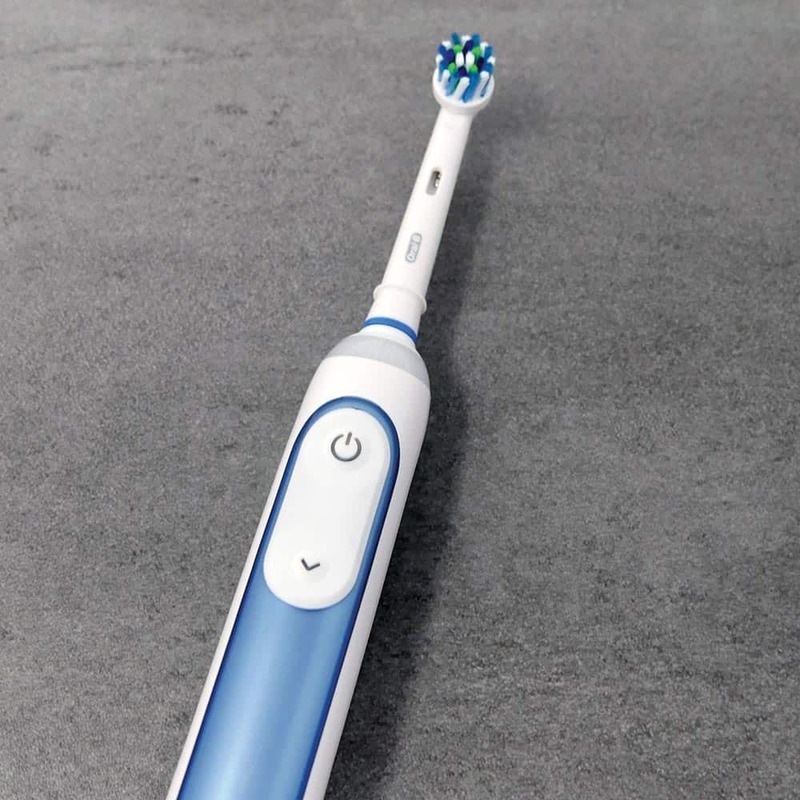 As the name implies this mode is designed to help those with sore or inflamed gums, but reducing the number of movements in the brush head, making for a more comfortable brushing experience, until the sensitivity has gone or reduced. This mode is great if you are suffering from gum disease. A lot more detail on the differences is provided in our article, Oral-B cleaning modes explained. A smaller, but relevant difference relating to the cleaning modes is that the motor in the Pro 2 2000 is a bit more powerful and actually offers more movements than the Pro 600. The Pro 600 offers 8,800 oscillations and 20,0000 pulsations whilst the 2000 offers 9,900 oscillations and 45,000 pulsations. A bigger difference and potentially useful feature for first time electric toothbrush users is the inclusion of a pressure sensor on the 2000. On the rear neck of the 2000 brush handle is a red/orange piece of plastic which has sat behind it an LED. When the brush detects that too much pressure is being applied to the teeth during brushing the LED illuminates and emits a red light. At the same time the brush motors speed reduces and the sound from the brush also changes. Together these alert you to relieve the pressure when brushing. Once relieved the light will go out, the brush motor speed up and the sound change again. Bristles of the brush head should just skim the tooth surfaces. You don’t need to brush hard to clean your teeth effectively. Over time you will learn how much pressure you need to apply and it will essentially become redundant for most within a few month’s. The next big difference is the battery life. The Pro 2 2000 has over twice the usage time. The Pro 600 will operate for 28 minutes, which is 7 days of cleaning based on one user. However the Pro 2 will last for 66 minutes which is 16 days of usage time. A big improvement, it means you can go between charges for longer and works better for those who travel and are away from power. A smaller and final difference between the two models is the colour of the brush handles, or more precisely the rubber grip that runs down the front of it. 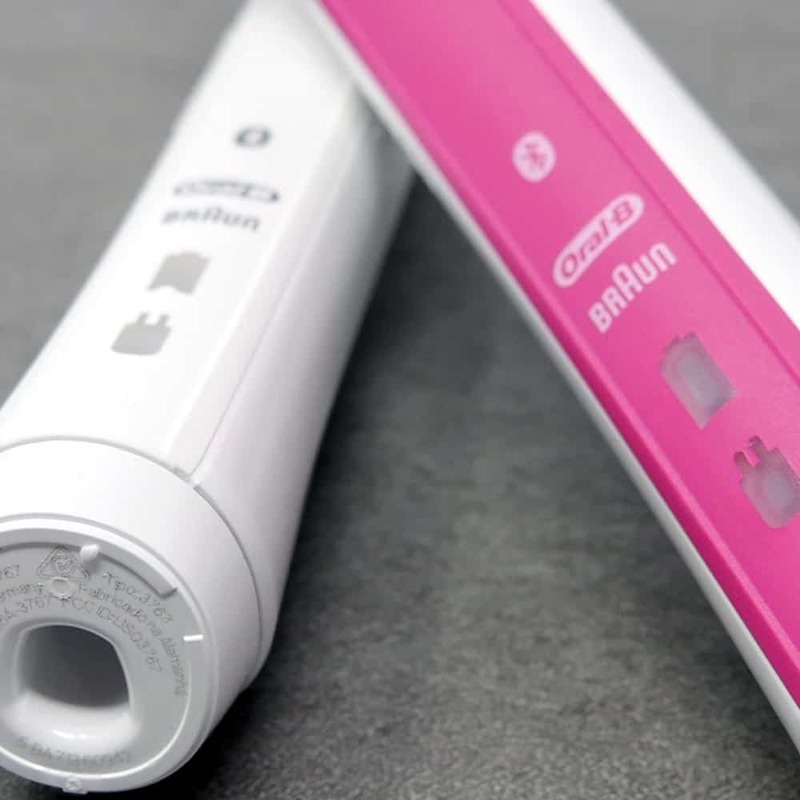 The 600 comes in light Blue or Pink whilst the Pro 2 2000 comes in a dark Blue or Pink. Both have gloss white plastic bodies. Aside from this the two brushes feel the same in hand, weigh the same and have the same warranty, they both come with a charging stand and 1 brush head in the box. With only a couple of slight differences between these two models, the Pro 3 3000 is the more premium and expensive of the two. Both have the same physical design, look and feel in hand. They have the same battery and power delivered to the brush head. A pressure sensor and timer are built into brush handle too. Both brushes come with the standard standard ‘Daily Clean’ mode. They both then have a Gum Care mode. You can learn more about this mode and how it differs but reading our article, Oral-B cleaning modes explained. In our mind, the Gum Care cleaning mode would be well complimented by a Sensitive brush head that Oral-B offer. Strangely with the 3000 a standard CrossAction brush head is included as it is with the 2000, but also a 3D White brush head. Now the brush heads are interchangeable and can be used on any cleaning mode. However, some brush heads are better suited to certain modes and it would have made more sense in our opinion to have included the Sensitive head given that one of the selling points of the 3000 is that cleaning mode. We have to praise the 3000 for having a travel case included. It might be something you overlook, but whether you travel frequently or not, it’s a great accessory for not only protecting the brush and the head from damage, but accidentally activation too. It is just a bit easier than putting them both in a wash bag or small carrier bag. It is not the most robust, but perfectly functional and allows the brush to breathe. 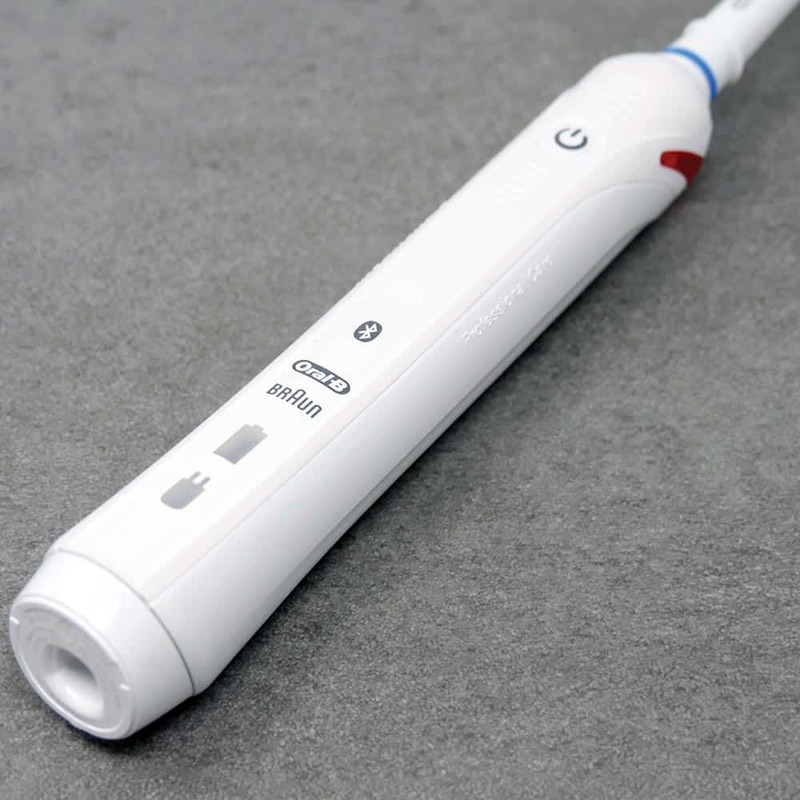 The Genius 9000 is the flagship electric toothbrush from Oral-B, but actually we think that for many the Smart 5 might be the better all round purchase. The only caveat to this is the price at the time of purchase. Quite often the Genius is discounted and it comes in at a very desirable price. So, the most obvious difference on first glance is the design. The Smart 5 5000 is slimmer and lighter than the Genius 9000. However, depending on your viewpoint the 9000 is has the more premium look to it. There is not much difference in the size and weight all told, only a few grams but sit them side by side and we think that most would prefer the in hand feeling of the Smart 5. BUT, one of the biggest flaws of the Smart 5 is the fact that you can’t easily tell what cleaning mode you are using. The Genius resolves this issue to a point with a series of icons that illuminate on the handle when the selected mode is in operation. You have a dedicated cleaning mode button too. Press this to change cleaning modes on the 9000. With the 5000 you have to press the power button multiple times. With either you have to power the brush on to change mode, but the Genius will remember the cleaning mode and start on this next time it is powered on, the 5000 does not. 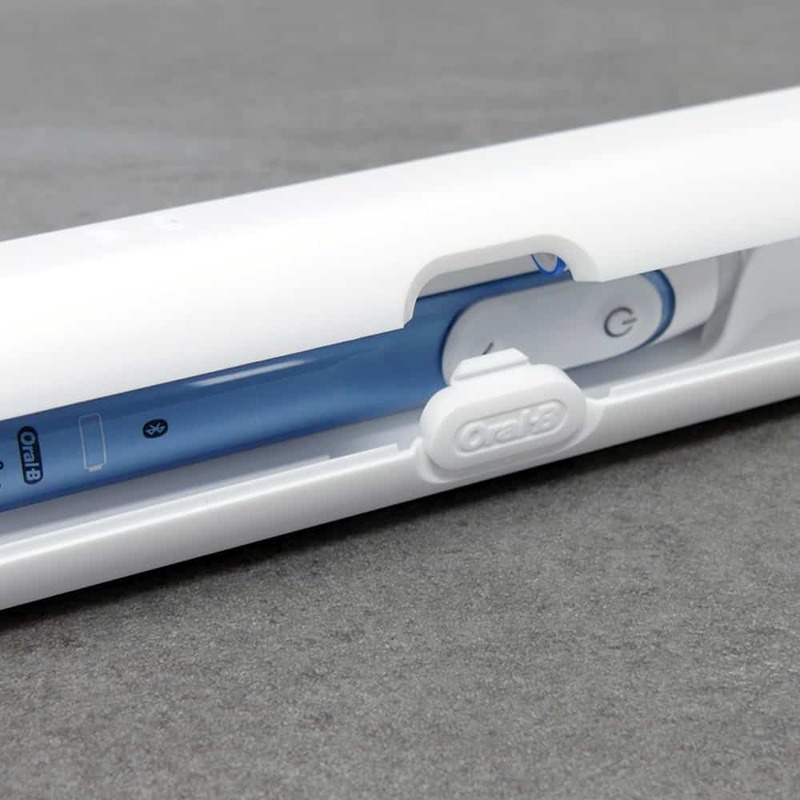 On the subject of cleaning modes, the Genius 9000 has an extra brushing mode known as ‘Tongue Cleaning’ mode. This is a cycle that lasts for 20 seconds with 7300 oscillations and 30,000 pulsations and designed for as the name suggests, cleaning the tongue. The reality is that you could use any mode on the brush to clean your tongue just ending the clean sooner. Although the speed and number of oscillations will be different. Both have pressure sensors built in, but the 9000 has an LED smart ring that goes all around the neck of the brush. Customisable one of 12 colours, the whole ring lights up when pressure is detected. On the Smart 5, just a smaller rear mounted LED panel illuminates. It’s a nicer design on the Genius, but by no means essential or has limited enhancement on the overall experience. The marginally thicker profile is also likely as a result of the extra technology that is built into the brush. 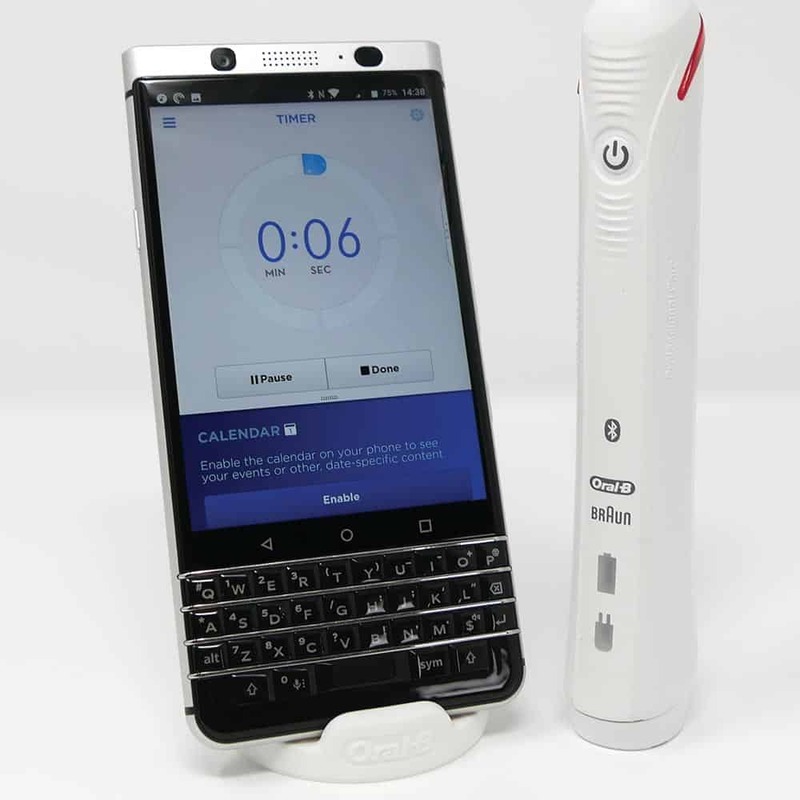 Whilst both brushes have Bluetooth connectivity and are considered ‘smart’ as they connect to a smartphone, the Genius has something known as enhanced tracking. 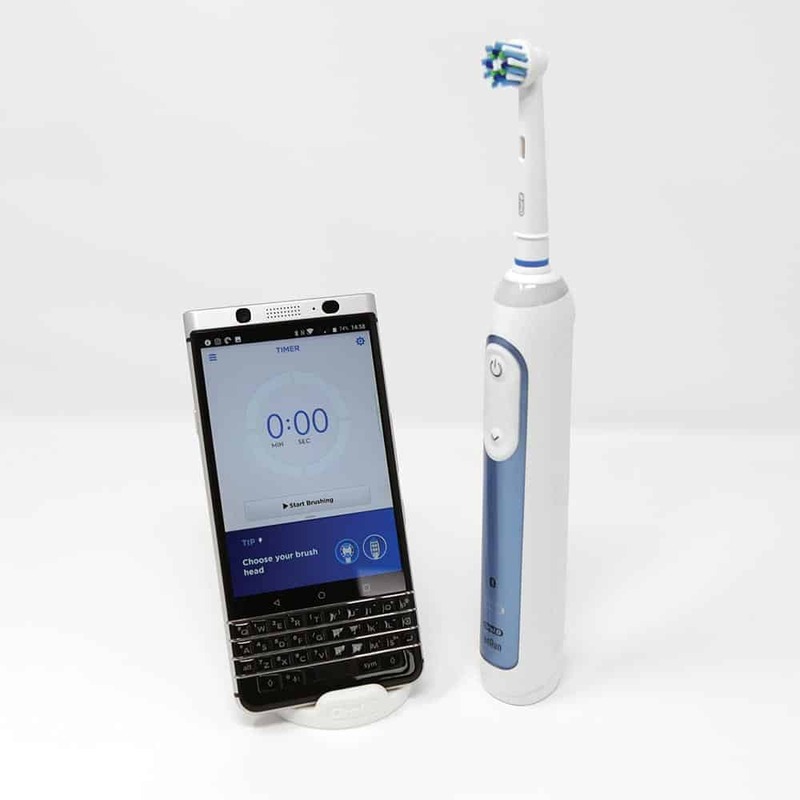 This enhanced tracking uses the front facing camera on your smartphone and sensors in the brush handle to accurately detect the position of the brush within the mouth. The idea is that it provides and enhanced cleaning experience and feedback as a result. Its clever, but requires dedication and commitment that many are not prepared to give, particularly due to the setup. What do we mean? Well in the box comes a smartphone holder with the Genius 9000. It has suction cup on it that needs to attach to a mirror or wall in your bathroom. You put your smartphone in before brushing, stand in front of it and the app, camera, and brush work together to give you this data. It’s a bit of a hassle as you need to stand almost perfectly still in front of your camera and a smartphone holder like this is not what most of us want in a bathroom. The Smart 5 5000 does not have the enhanced tracking but does offer still a good range of connectivity features and feedback on how you cleaned. We think on the whole whilst more data is better what the Smart 5 offers is more than enough for most! The Smart 5 5000 comes supplied with a more suitable holder too. It sits on a work surface rather than needing to be attached to a wall. It is our opinion is smarter and less unsightly. You just need to pop your phone in it, which takes a couple of seconds compared to the tens of seconds with the genius brush configuration. You phone then sits in portrait or landscape orientation and shows the on screen timer. The last difference is the battery life and this is a bit of a shocker. Given that the Genius 9000 is the more expensive of the two the Smart 5 actually has the better battery life. Lasting up to 16 days or 66 minutes in our testing, that is an extra 4 days or 16 minutes of usage time. Put these two brushes side by side and the differences between them are much harder to tell, they look almost identical, however there are some subtle differences. The first is the colour, the Smart 6 has a Silver/Blue front panel and a white body compared to the broader range of colours on offer with the 9000. The 9000 comes in an all White, all Black and Rose Gold and White colour option. Aside from the colour of the brush the physical size and shape is identical and you would not be able to tell the two apart unless you noticed the additional cleaning mode icon found on the 9000. Given that this icon only lights up when the mode is selected, it is hard to tell, but the Genius 9000 does offer a Tongue Cleaning mode that the Smart 6 does not. This is a cycle that lasts for 20 seconds with 7300 oscillations and 30,000 pulsations and designed for as the name suggests, cleaning the tongue. The reality is, you could use any mode on the brush to clean your tongue just ending the clean sooner. Although the speed and number of oscillations will be different. 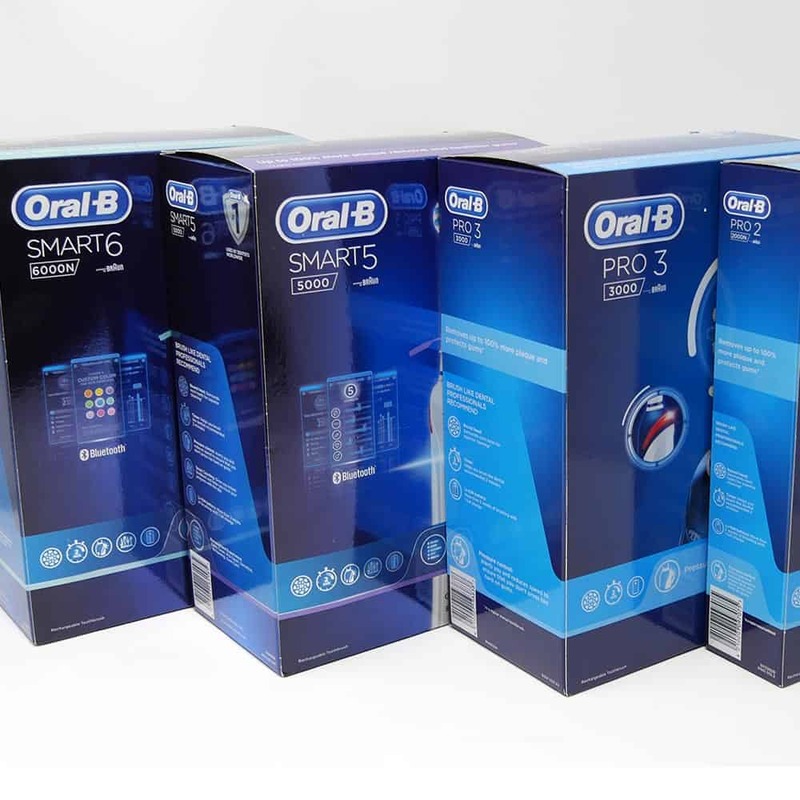 Interestingly, despite the similar design, the Smart 6 is actually part of a range of brushes that includes the Smart 4 and 5 that sit below the Genius range. Both brushes offer Bluetooth connectivity, which means that they connect to an Android or iOS smartphone via an app. Both brushes will track your cleaning performance and log it in the app whilst providing real time feedback, but the Genius 9000 can go one stage further. 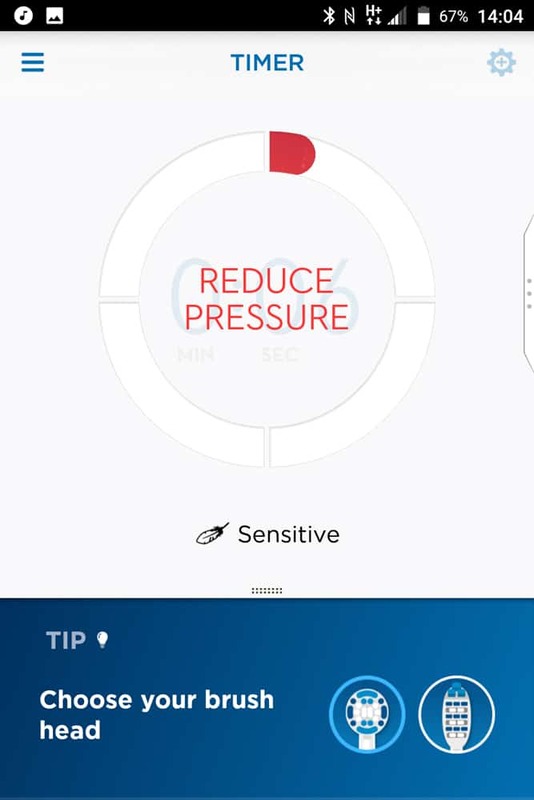 Known as enhanced tracking, the app installed on your smartphone uses the front facing camera and sensors in the brush handle to accurately detect the position of the brush within the mouth. You have to stand in front of your smartphone when brushing and can’t really move as the brush movements needs to be seen by the camera. 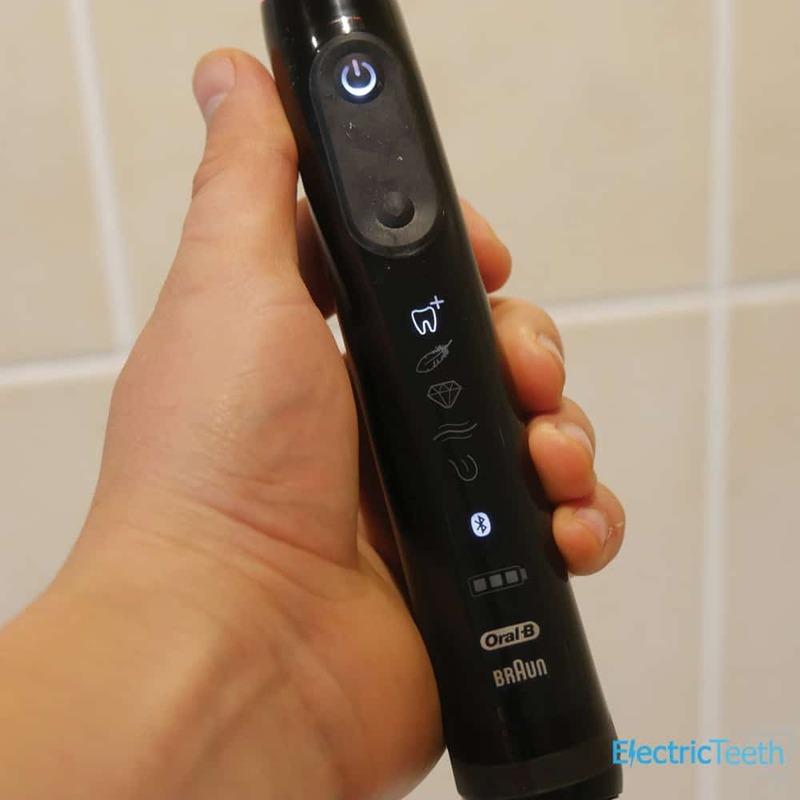 The idea is that it provides and enhanced cleaning experience and feedback as you brush. Both aim to give feedback as if a dentist was monitoring your clean, but the 9000 just gives the feedback in a more interactive and instant way. Both are designed to educate rather than lecture you on the ‘best’ method. The end goal is better oral health. The problem is that the 9000’s enhanced tracking requires dedication and commitment that many are not prepared to give, particularly due to the setup. In the box with the 9000 comes a smartphone holder, with a suction cup, much like you might have in a car. In this instance you adhere it to a mirror or wall wall in your bathroom, at head height. You put your smartphone in before brushing, stand in front of it and the app, camera, and brush work together to give you this data. All told, whilst the idea and ethos is good it is a bit of a hassle. We think on the whole most will prefer the experience the Smart 6 offers. The Smart 6 6000 comes supplied with a more suitable smartphone holder too. No suction cups, just a more traditional dock configuration. Smaller and less unsightly, it is designed to sit on a worktop rather than adhere to a wall or mirror. You just need to pop your phone in it, which takes a couple of seconds compared to the tens of seconds with the Genius brush configuration. You phone then sits in portrait or landscape orientation and shows the on screen timer. Other in the box differences are the travel case, brush head stand and brush heads. So, both models come with a place to store brush heads, but the compartment with the 9000 is better than the stand offered with the Smart 6. The Smart 6’s brush head holder is a moulded piece of plastic that clips round the charging stand and offers up 2 prongs. The brush heads then sit on these. It keeps them upright and they do not touch, but they are not covered like they are with the compartment with the 9000, which can accommodate up to 4 brush heads. Both do a job and give a home to brush heads, but the 9000 is a neater and more desirable solution. The Smart 6 comes with 1 x CrossAction, 1 x Pro White/3D White and 1 x Sensitive brush head, but the Genius 9000 comes with one additional brush head, that is the FlossAction head. Despite both brushes coming with multiple brush heads, the travel cases provided with each brush are capable of holding the brush handle and 2 heads only. The Smart 6 travel case is better than some of the cheaper models. It is a white colour and is fairly robust. Putting this to shame is the 9000’s travel case which is heavier, bulkier but much more premium to look at and touch. 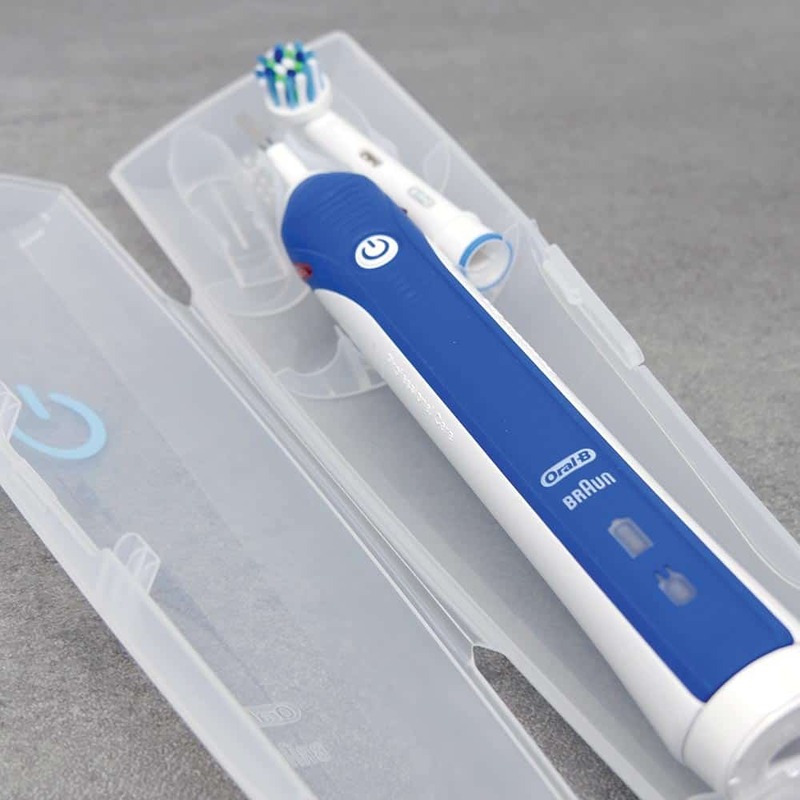 It also has the ability to charge the brush in the case, by connecting the provided charging cable. If this is not enough, a USB cable can be connected to the case and charge a device like a smartphone. There is no battery in the case, to charge the brush and anything connected via the USB cable the case has to be connected to mains power. Another slight difference is the 9000’s lovely travel case has a clip built into the lid that holds a smartphone, for using the app when travelling. The final difference is the battery life. This one will likely surprise you. Whilst the Genius is the premium brush it offers inferior battery life. Our testing has confirmed that the 9000 offers 12 days of usage time compared to the 18 days on the Smart 6. The Smart 6 retails typically for around £100 despite its £220 recommended retail price. Normally around £40-50 more expensive than the Smart 6, there are times when the 9000 comes down in price to about the same as the Smart 6, making it the much better buy at these times for the benefits it offers, even if the battery life is worse. 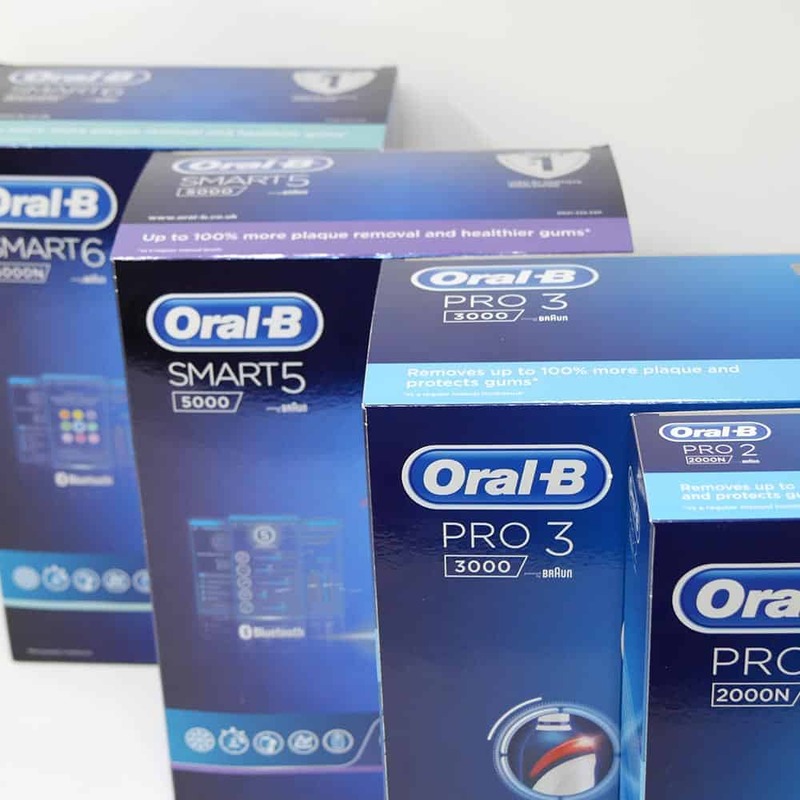 As you will have understood, this article focuses on the newest models from Oral-B. But there are too a number of older models that are still available and worth considering. We have not compared these within this article but here are a few useful links to popular comparisons. If we have failed to answer a question or you need to know more, you can search our site for answers, read reviews and the content we have or get in touch via our contact page or by leaving a comment below. I now use a 6000 and a 2500, both are last generation as of Jan 2019.
the 2500 and 6000 have the same speed. That’s a no-brainer. However, the 6000 has the “Pro-Clean” Cleaning Mode. And this mode “runs” noticeably faster.